Since bathrooms are infamous for the notorious shortage of space, judicious management of available areas is a must without causing clutters. A wood textured cabinet can render the elegance that you need. Rather than scattering your electronic amenities around, use your closed cabinet to keep things at the place. An often overlooked space is that underneath the sink. Detachable shelves can often be handy at this space to keep things not regularly used. Mirrors have been playing probably the most crucial role in human psychology. When you desire to become a part of Aspirations upcoming residential apartments in Kolkata, your destiny of meeting royalty must be self-clarifying. 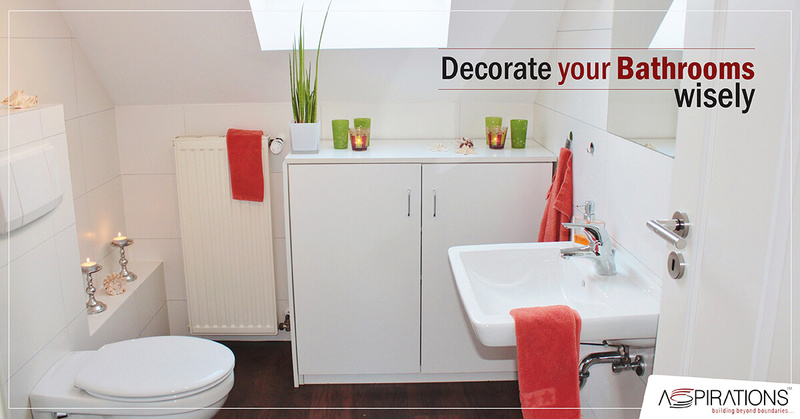 Mirrors when added in multiple numbers to your bathroom, invariably increase the available space through reflection. Beyond the obvious, what stands more important is the appreciation of the self while inhabiting a luxury house – it is then the glory of living meets aesthetic grandeur. The use of curtains gives you the idea of a more privatized Hand-woven designs offer you a punchy look relevant to the elegance that you wish to share. Moreover, looking for curtains with pockets can also turn out to be handy. Aspirations best residential projects in Kolkata aspires to keep you and your guests enchanted! The essential aspect must look surprising. Aspirations top residential projects in Kolkata provide you premium designer commodes that never fail to steal the show. Commodes are now automated, and the seats open and close according to your movements. They come now with auxiliary accessories like automatic heat controlling toilet seats or a water mixture. Moreover, the exteriors are also textured to indulge you in the appreciation of beauty. This is where your bathroom starts getting interesting. Candles are no more restricted to dinner tables. Dim lights from candles can make your experience of relaxation even more breath-taking. A romance with aesthetics gets displayed in every candle-stand that you manage to incorporate to enhance the decor. If relaxation becomes the only agenda before a hectic start or at the end of the day, why not make it grand? Come and experience Aspirations best residential projects in Kolkata.